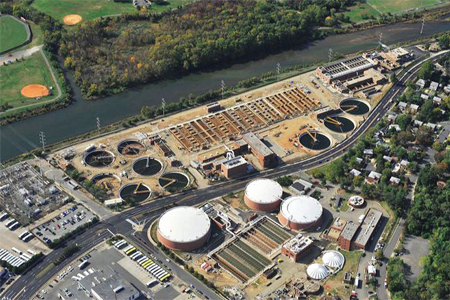 Arlington County’s Water Pollution Control Plant (WPCP) in South Arlington, VA, is located on 35 acres of land squeezed into a commercial/residential neighborhood less than a mile west of Ronald Reagan Washington National Airport. The facility treats flows from nearly all of Arlington. In addition, nearly 20 percent of the plant’s flow comes from neighboring localities such as Alexandria, Fairfax County, and Falls Church. Effluent from the plant is discharged into Four Mile Run to the south, which feeds into the Potomac River and, ultimately, the Chesapeake Bay.